Hand rubbed Cherry finish plaque with a gold Florentine border with marble center on a gold embossed back plate. Individually boxed. Hand rubbed Cherry finish wood plaque a ruby marble plate. Individually boxed. PRICING INCLUDES ENGRAVING ! Hand rubbed Cherry finish wood plaque with a sapphire marble plate. Individually boxed. PRICING INCLUDES ENGRAVING ! Cherry finish plaque featuring a gold Florentine border with textured black center engraving plate. Individually boxed. PRICING INCLUDES ENGRAVING ! Cast metal achiever figure, highly polished with gold tone finish. Individually boxed. PRICING INCLUDES ENGRAVING ! Cast metal achiever figure, highly polished with gold tone finish. Individually gift boxed. PRICING INCLUDES ENGRAVING ! Classic Achiever Trophy cast metal, hand-polished figurine with gold tone finish on black piano-finish base. Individually boxed. PRICING INCLUDES ENGRAVING ! 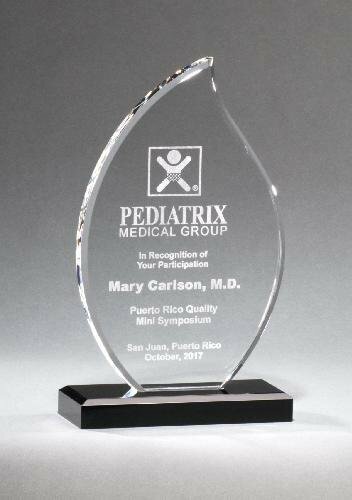 1" thick, free-standing acrylic award. Jade only. Presentation boxes not included. PRICING INCLUDES ENGRAVING ! Classic Series freestanding clear acrylic award. The bottom of the award has a blue accent that is reflected into the bevels. 1" thick, freestanding acrylic. Individually gift boxed. PRICING INCLUDES ENGRAVING ! Clear crystal flame on black crystal base. Produced from the highest quality optical crystal this flame award will show the recipient how important they are to your organization. Packaged in padded, satin-lined gift boxes.